YEREVAN (RFE/RL)–Armenia’s long-standing bid to join the Council of Europe has received a crucial endorsement from a highly positive report commissioned by the respected organization promoting human rights and democracy. The report drafted by its chief rapporteur on Armenia–Demetrio Volcic–says Armenia has made "very considerable progress" in democratization and will qualify for membership after making a "written commitment" to further political and judicial reforms and a peaceful settlement of the Nagorno-Karabakh conflict. "The rapporteur thinks that he is now able to propose to the Political Affairs Committee–and subsequently to the Parliamentary Assembly–to recommend the Committee of Ministers to invite Armenia to become a member of the Council of Europe," says the report obtained by RFE/RL . "Armenian membership of the Council of Europe would be a natural development. Membership would also reinforce the country’s democratic reforms and would be a consecration of its efforts to join the European family," it concludes. The conclusions made by Volcic after a series of fact-finding missions to Armenia were unveiled at a meeting of the organization’s Political Affairs Committee in Paris on December 16. The committee’s recommendations will be decisive for one of the main objectives of Armenian foreign policy. Hovannes Hovannisian–chairman of the Armenian parliament’s foreign relations committee who attended the Paris meeting–said earlier this week that Volcic’s report paved the way for Armenia’s accession to the Council of Europe "in the first half of next year." He said the political committee will spell out conditions for Armenia’s membership in time for the next session of the Parliamentary Assembly due in late January. "Since the beginning of the accession procedure Armenia has made very considerable progress–whether in setting up a pluralistic political system–establishing the rule of law–or observance of human rights and fundamental freedoms," the Italian rapporteur concludes. "The rapporteur considers that human rights are now respected in Armenia." But the report adds that Yerevan still needs to take steps to "prevent abuses and arbitrary decisions by state bodies and in particular "guarantee independence of the judiciary and proper functioning of the courts." While declaring that "the legislative basis for the rule of law is in place," the report says the Armenian authorities should ensure the due process of law in practice. Judicial reforms have featured large in the list of Council of Europe requiremen’s to Armenia–which has often been criticized by international human rights groups for widespread mistreatment of citizens in custody. Another Council of Europe rapporteur–Dumeni Columberg of Switzerland–is expected to submit a separate document on the state of Armenian judiciary to the Committee on Legal Affairs and Human Rights in Strasbourg early next month. Columberg visited Yerevan earlier this month. Volcic’s report also notes a marked improvement in Yerevan’s handling of elections which incurred international criticism in the past. The report says the current Armenian parliament was "formed as a result of free–democratic elections" of May 31–1999. A Council of Europe monitoring mission described as "free and fair" Armenian local elections held last October. The polls took place several days before the shock assassinations of Armenia’s prime minister–parliament speaker and six other officials during a parliament session. 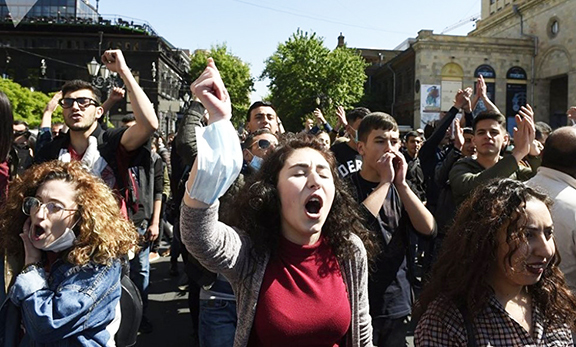 The killings undercut a political equilibrium that came into existence after the May elections–leading to a bitter power struggle in Yerevan. But Volcic indicated that the parliament attack has not affected Armenia’s membership chances. "Despite the scale of the tragedy,… the country remained calm and composed," the report says. "Instead of the destabilization perhaps sought by its perpetrators–this crime has demonstrated the solid foundations of Armenian democracy–which has abided by the Constitution." The Italian rapporteur also argues that Armenia’s accession to the organization comprising 41 countries "could be a positive element in settling the conflict–provided it is accompanied by a top-level formal written undertaking to prescribe the use of force and to spare no effort to resolve this conflict by peaceful–negotiated means." Such a commitment on Karabakh should be made by the speaker of the Armenian parliament–he specifies. Council of Europe officials have said in the past that they would prefer a simultaneous accession of Armenia and Azerbaijan after the two countries show a genuine interest in ending their conflict over Karabakh. But Lord Russell Johnston–the president of the Council of Europe Parliament Assembly–said in Yerevan last September that Armenia’s accession will not be affected by the Karabakh dispute and its membership bid is considered separately from Azerbaijan’s. A mission from the Council that monitored the recent local elections in Azerbaijan strongly criticized their conduct. "I would be very surprised if Armenia doesn’t join [the organization] some time next year," Johnston said. Georgia was the first of the Caucasian states to secure full membership in Strasbourg earlier this year.